Hi all! Lola and I are indeed alive and well and still loving the sunny weather. I have gotten a few comments and questions about what in the world is happening with my blog. As you’ll notice, nearly all the photos are no longer working because the site I host them all on arbitrarily decided to stop allowing third party hosting. I am working on alternate hosting, but I’ll have to start from scratch with everything and somehow try to work backwards and figure out what photos went with which entries and re-create them all. I might just delete most of the content (except for a few that I think still hold up and get a lot of hits, like the cage reviews), and start anew. Several entries are due for updating or rewriting… my thoughts have changed maybe considerably about a few topics. Trying to figure out what works best and won’t take a lifetime to rebuild. It’ll probably be a few months until we’re all back up and running, but in the mean time, I’ll leave the old content up. I’m happy to say life has calmed down a little bit… and I’m really excited to have some time to be more active in the avian community again. I’ve resurfaced on Facebook groups and Avian Avenue, and my next step once the blog is restored is to start writing again! My summer project is also to start taking woodworking and welding classes. Not sure if that will lead to anything more right now because I am one of the most accident prone people I know, but we’ll see. Many of you have asked what is the best way to reach me. I apologize for not reliably responding to comments. I read them all and try to respond, but sometimes they slip through the cracks. Failing that, you can connect with me on Facebook (username is Coco’s Flock). I would suggest both sending a friend request and a private message, because sometimes if you only send a message it goes into a different inbox and doesn’t notify the user. And if you really want my attention, I’m also on the forum Avian Avenue (username is lotus15) and you can either tag me there or send a private message. In the mean time, let’s hope I can figure out a photo solution! Hello, parrot people! It’s been too long. But Lola and I are doing well, and so much has changed for us since we last wrote. We are now proud residents of sunny California, where we have been enjoying the year-round beautiful weather, and many more days outside soaking up vitamin D. Lola and I made an epic cross-country road trip together, where we got to see many, many parts of the U.S. we’d never seen before. In less happy news, Lola came very close to getting a new sister and flock mate, another female cape parrot. She was a much, much older and retired breeder, but unfortunately she passed away at home just a week before we planned to adopt her. We all agreed it was for the best that she passed away in comfortable, familiar surroundings. And we are still waiting for our perfect adult female cape companion for Lola. I am even more sad to say that this fall, Scott Lewis of Old World Aviaries passed away. Scott was truly a giant in the cape parrot and general aviculture community. He was a wonderful man who had extensive expertise and was always willing to share it and help out. 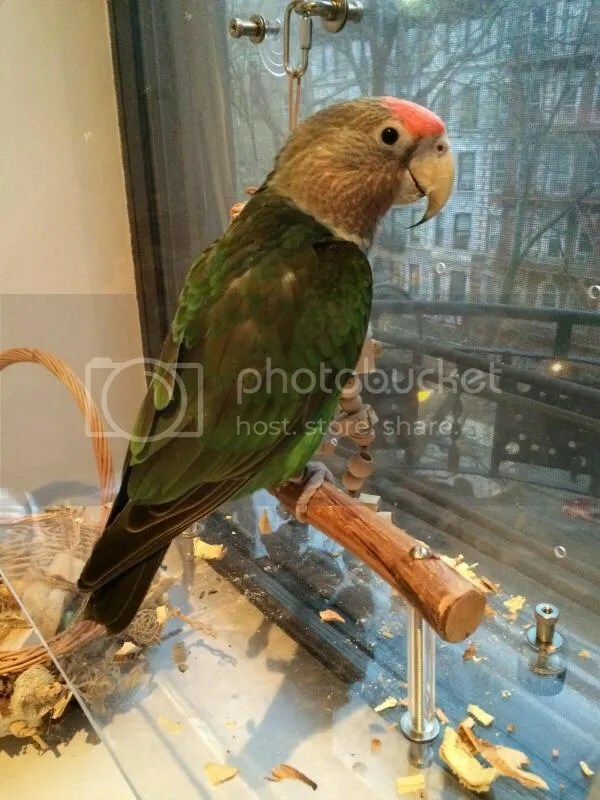 When I was first researching what parrot species would suit me, I found videos of the most charming parrot online, Thor, who I learned was a cape parrot from none other than Scott Lewis. His website provided a wealth of information, and when I emailed him letting him know that I was interested in learning more, he immediately offered his help and knowledge with absolutely no expectation that I would be a customer of his. When I eventually chose another breeder, whom he happened to know, he had only the most wonderful things to say about her and told me I had made a great choice. And he and I continued to discuss cape parrots, their classification, their diets, their habits, and their all-around wonderfulness for many years after that. He was a kind man who genuinely loved parrots and spreading that love. Rest in peace, Scott. You are already sorely missed. 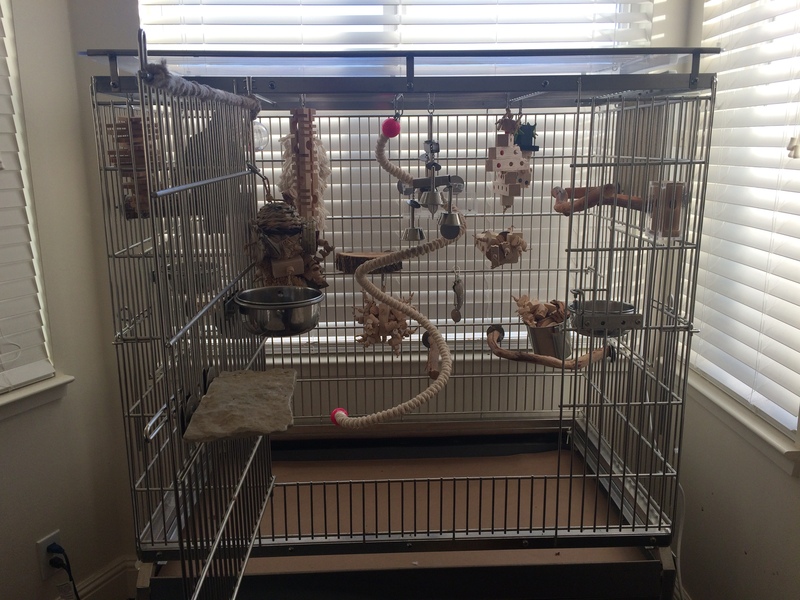 I thought I’d share Lola’s latest cage setup, which we are still perfecting for optimal perch placement. The front panel’s lower area is pretty empty at the moment but I can’t seem to find a spot that won’t get soiled daily. So we’re still experimenting. Also, apologies for terrible photos. These were taken in the early morning, and although the room was sun drenched and lovely, the photos look quite dim due to the back lighting. I often get messages asking if I still recommend Expandable Habitats, and the answer is an effusive yes! Lola’s cage is still going strong and is every bit as sturdy as the day it came home. They’re a big investment, but it’s a lot of peace of mind to never have to worry about checking all of the bars for chipped paint or rust, or worrying that there is something toxic that could hurt her. Starting with the left side, there’s a food bowl on her main door, along with a fun natural and shreddable toy. (There’s also a flagstone platform perch to the left of the bowl, but it’s not visible in this photo.) 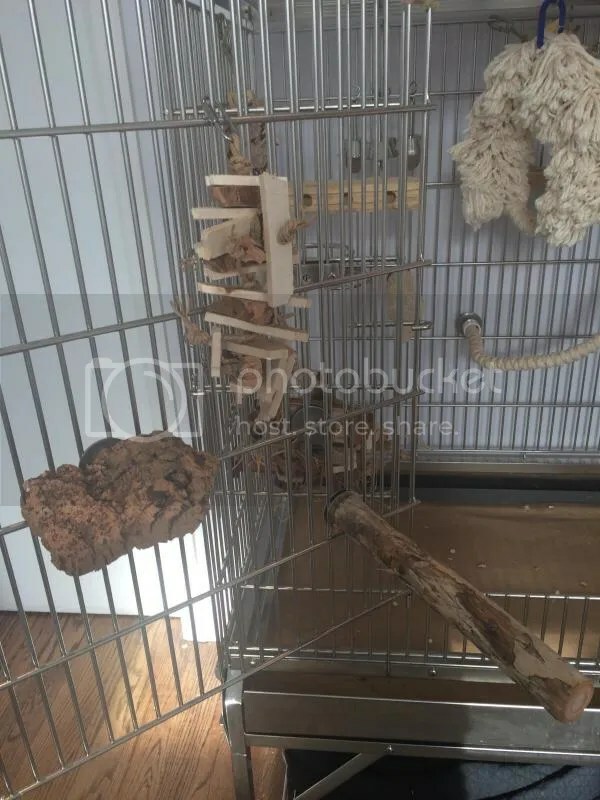 Just behind that toy is a safety pumice perch, and above that is a chunky willow wood perch with lots of delicious bark (and Lola sitting on top of it, playing with her acrylic ball foraging toy). On the side door of the left panel of the cage is another food bowl, and next to it a fantastic foraging perch. 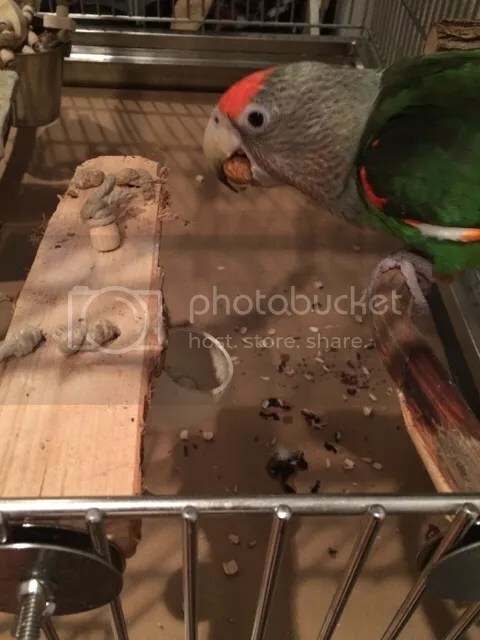 I love these perches– lots of ridges for chewing but also holes drilled throughout for stuffing with food (I like stuffing them with stalks of carrots or cucumbers or zucchini, or in shell nuts). On the back wall there is a cardboard box holder in acrylic for more foraging fun. And all the way up in the corner is a hard-to-get treat pot. Lola’s got her soft and fuzzy swing hanging on this side, as well as another fantastic foraging block toy, hanging from the ceiling. (We’re big on foraging!) 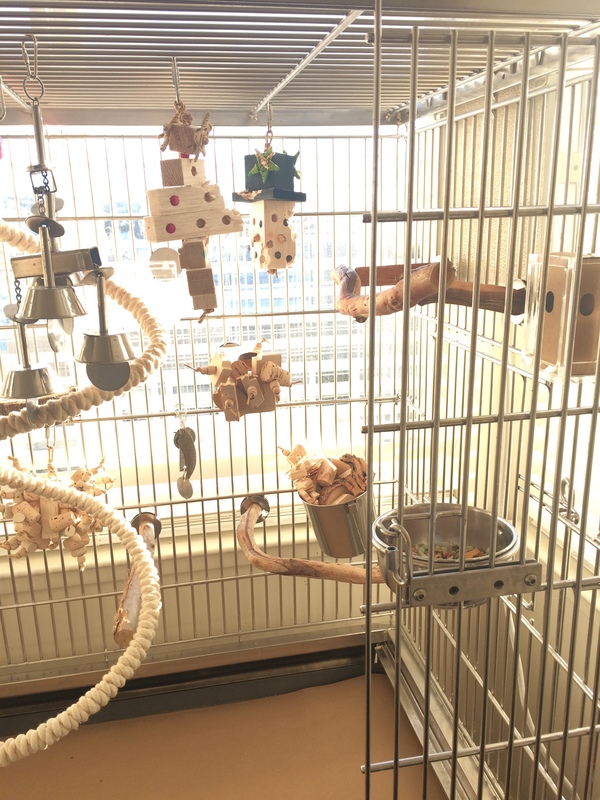 And on the right of this photo but the center of the cage is a lovely cotton boing with a great Avian Stainless bell toy that makes tons of noise hanging in the middle. 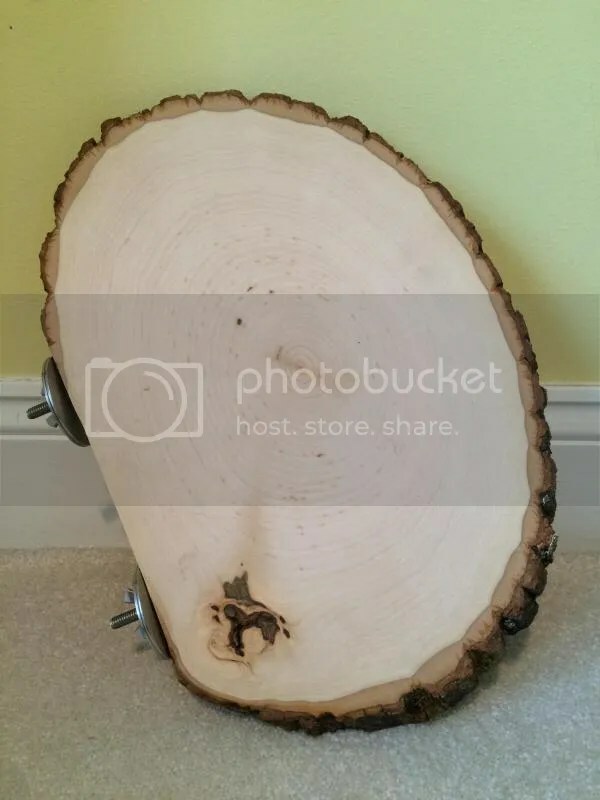 Around the center of the back panel is a platform perch, I believe in elm– Things for Wings always has so many beautiful types of wood for platforms. To the right of that is hard to see, but it’s an acrylic drawer foraging toy with two side-by-side drawers that pull and slide. And next to that is another really beautiful platform perch, this one with built-in toys on one and and lots of cork drilled into the sides. That one definitely keeps her busy. Up above you can see one balsa Christmas tree toy, which is hiding a second holiday toy behind it, a mini snowman’s head, both from Tweety Pie’s Bird Toys. Lola has made short work of the santa one. On the right, one of her favorite double-ended ribbon wood perches, still an old stand by. Next to it is a second cardboard box foraging toy with an acrylic holder. 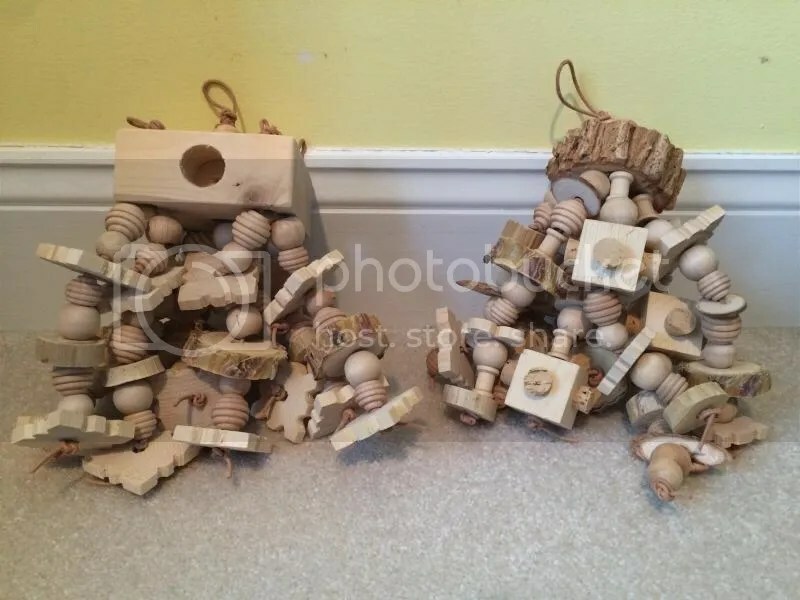 Below that layer is another with (on the left) a great toy packed with balsa and cork, a very prized cajeput perch that I’d been hoarding (sadly, it’s my last), and an Avian Stainless pepper toy. In the corner is Lola’s trusty stainless steel toy bucket chock full of stray toy parts and foot toys, straddled by a sandblasted manzanita corner perch. And up front here, another food bowl. And that’s it! So far, so good with perch placement of the existing perches. We like to rotate toys and also make sure there’s a variety of types and textures in there. So many toy companies have come and gone the past few years, but we are thankful for all of the wonderful toymakers who have provided Lola with so much enrichment and fun. It must be that time of the year, because I’ve been seeing a lot of posts about nippy and hormonal cape parrots. 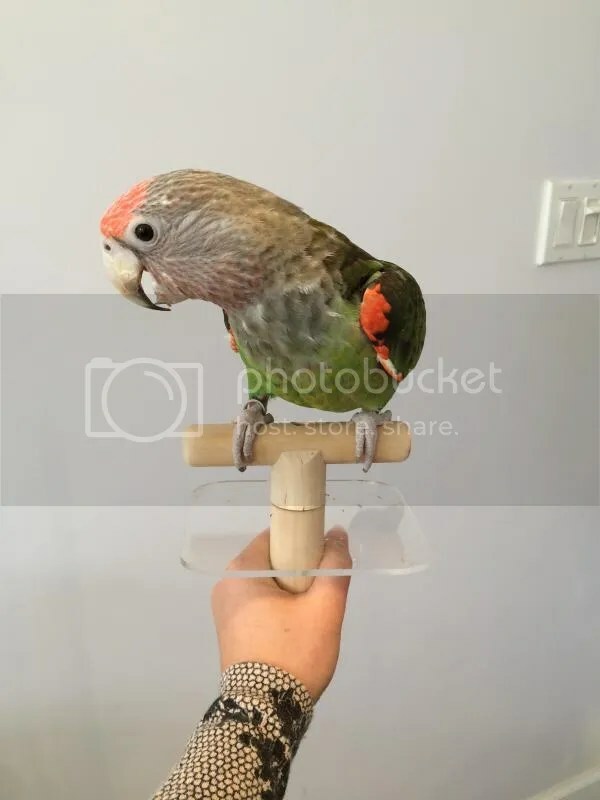 It hasn’t quite hit Lola yet, but one of the things I’ve done to prepare myself and others for when that time does arrive is to train her to use a hand-protecting step up perch. I think this is really key for when hormones do strike– and even better if you can get started well before they do, so that your parrot is trained to step up immediately by the time hormone season rolls around. The right type of step-up perch is necessary. 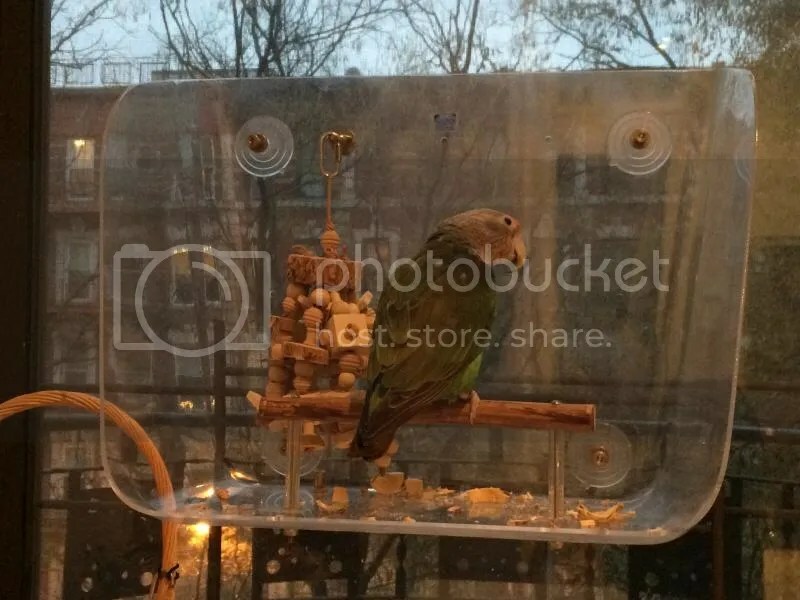 I chose one that is simple with no distractions, but also amply protects the hands so that you can safely transport your parrot into or out of the cage during those difficult times when you your parrot doesn’t want to be handled otherwise. It’s simply made of two dowels and a stainless steel screw, along with a small sheet of clear acrylic that protects your hand. It’s called the Buddy Perch and you can buy it at 4Z Birds, but I’m sure that if you’re crafty you can also make one yourself. (That being said, I was really pleased with the excellent customer service I received from 4Z Birds and highly recommend them! They were really fantastic to work with and put a lot of care into their products.) 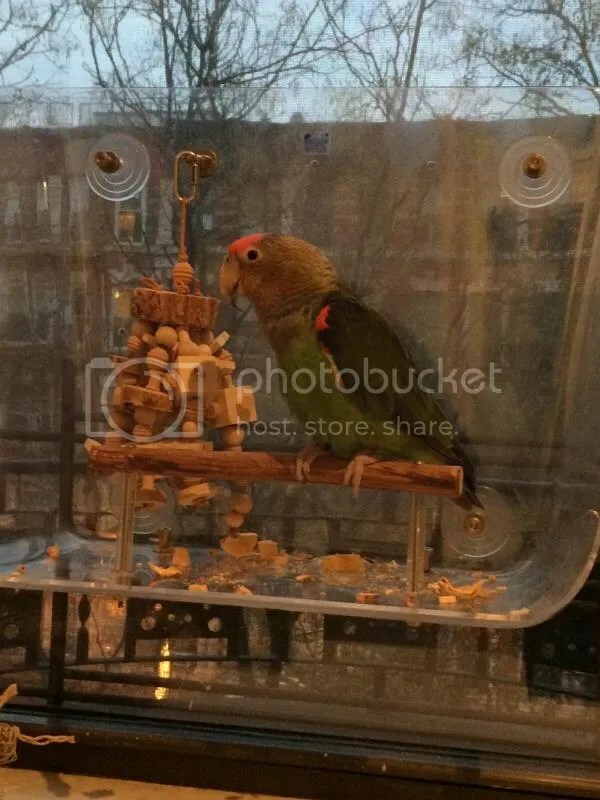 I’ve seen others that use coconut shells and natural perches, and a plastic one as well on the market. Funnily enough, Lola, who is normally not afraid of any new perches or toys, was absolutely terrified of this thing when I first took it out! It took a few weeks of persistent training and many an in-shell almond for her to realize that it’s her friend, not foe. 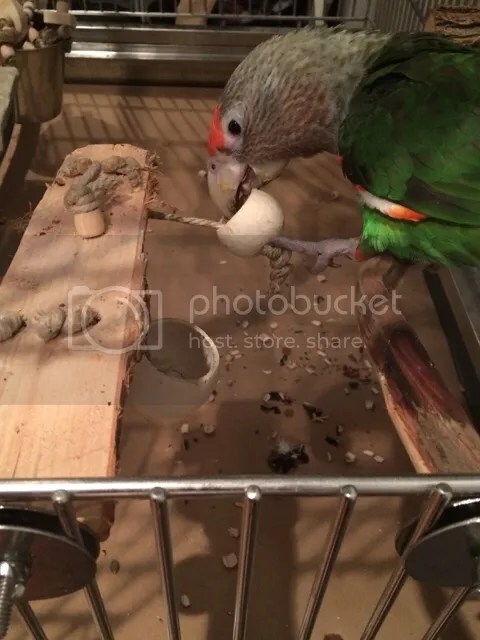 At first, the most I could do was get her just to touch it with the tip of her beak. But we went at her pace and she learned very quickly. I made sure to train her to step up whether it’s me or anybody else holding the perch. She is a little more hesitant with strangers, but she knows that stepping up = reward. It took less than a month for her to get really comfortable with it, and we practice consistently, even though hormones haven’t hit. That way, when they do come around, we’ll be ready. 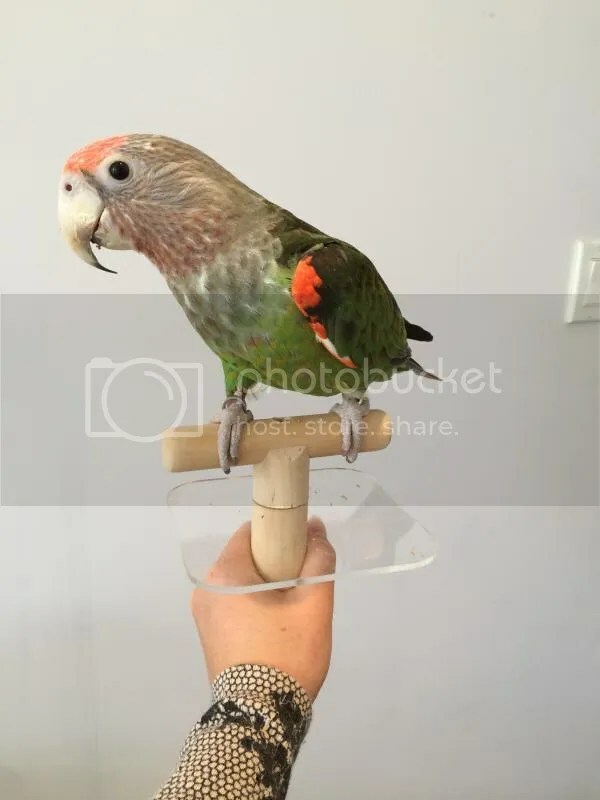 I think having your parrot trained to use a step up stick can also help in a lot of others ways. 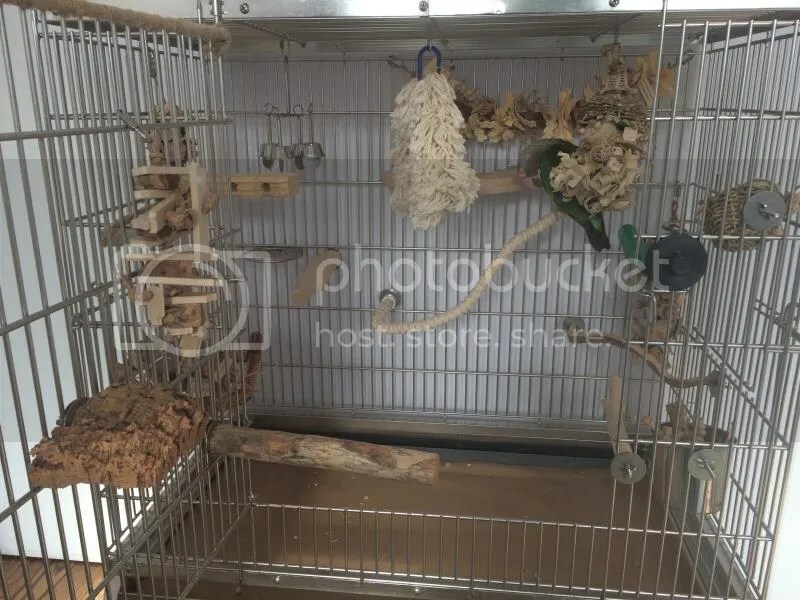 For example, if you ever want or need to travel and require a bird sitter, it can be difficult for the bird sitter to allow out of cage time or even retrieve your parrot if they accidentally sneak out of the cage while changing bowls or cleaning. But now that Lola’s trained to step up for anybody anywhere, I know that there will be no problem with getting her back in the cage safely and keeping everybody’s fingers in tact in the process. I definitely recommend training your parrots to use step-up perches as well. It’s great for some peace of mind and I’m sure it will come in handy when we find ourselves dealing with hormones! Nothing like a snow day to get in some extra snuggle time with your little loves! Juno didn’t actually bring all that much snow to our area, but I understand that some areas of New England really got dumped on. I hope everybody is staying safe and warm. Lola and I are taking today to get in lots of quality time. I also thought it would be nice to make some time for the blog! 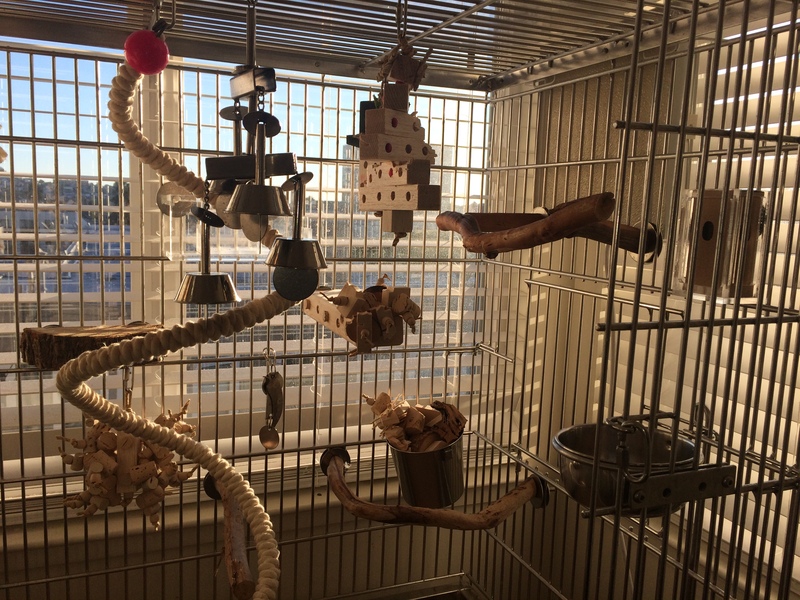 I changed Lola’s cage setup recently for the new year, and we’ve had a week or two already to test it out. She and I both approve. It’s a little different from our normal setups in that we usually have certain places we like certain perches to be, but I decided to change it up and see what happened. Here’s the full view, door open. 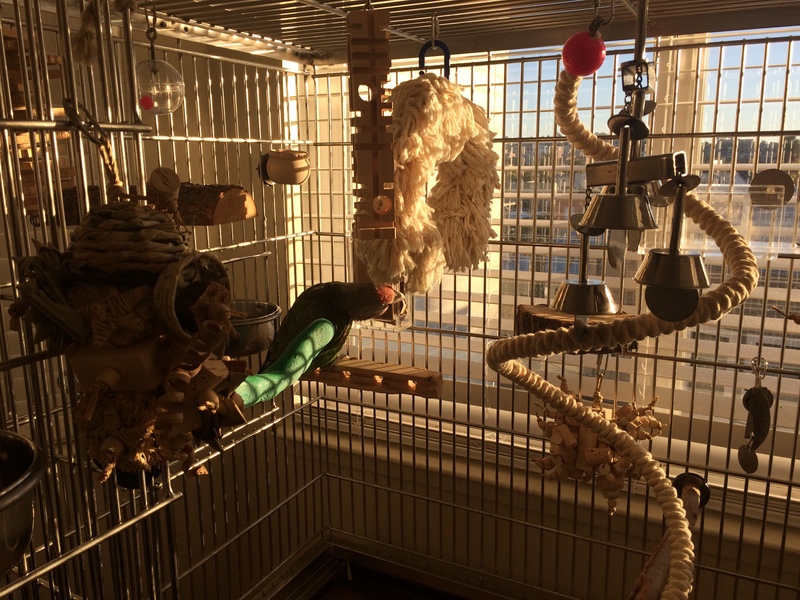 There’s a bit of a “bald spot” in the back– I had to take out a foraging toy for cleaning, but normally there’d also be a clear acrylic drawer foraging toy in the lower back between the cotton rope perch and the sandblasted manzanita corner perch. We’ll take a tour from left to right. Here’s the door, which is simple but has a few perching spots for Lola. 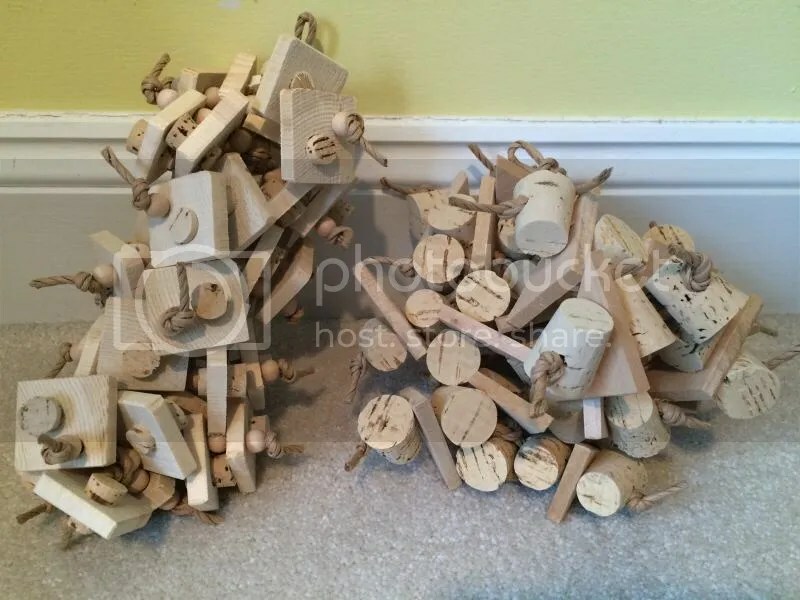 On the left is a natural cork bark perch from I Got a Woody Bird Toys, along with one of their fantastic basswood and cork toys (or, what’s left of it), and at the bottom on the right is a treasured cajeput perch. Yes, I may have hoarded a few of them over the years. Moving towards the left, there are two stainless steel ring bowl holders (the cage is empty right now because I was changing water and cleaning, etc.). The center top perch is one of the Fantastic Foraging Perches from Things for Wings. Lola loves this perch. The sides are totally torn up as she makes her way through it. I like to stuff treats or even veggies in the foraging holes. Try threading a whole skinny carrot or even a leafy green (broccolini can work nicely) through them. There’s another Things for Wings toy above that, and to the right is her favorite Avian Stainless toy, the Crosswinds. Moving downwards, on the far left is an awesome side-mounted toy from I Got a Woody, and Lola’s trusty double-bolted ribbon wood perch from the Birdsafe Store in the middle. Normally, I always put this one high up as a roosting perch, but I’m actually finding it works nicely in that spot. The area below the side door is always kind of a weird place because you can’t really hang toys on the door or else they get in the way when you’re opening and closing them, but this perch allowed me to put the foraging pot in the middle, and gives Lola some room to move around easily. Finally, on the right is an Eco Perch from Polly’s. I like that it helps to keep Lola’s nails trim, but is not at all abrasive. Here’s the center back (and Lola!). 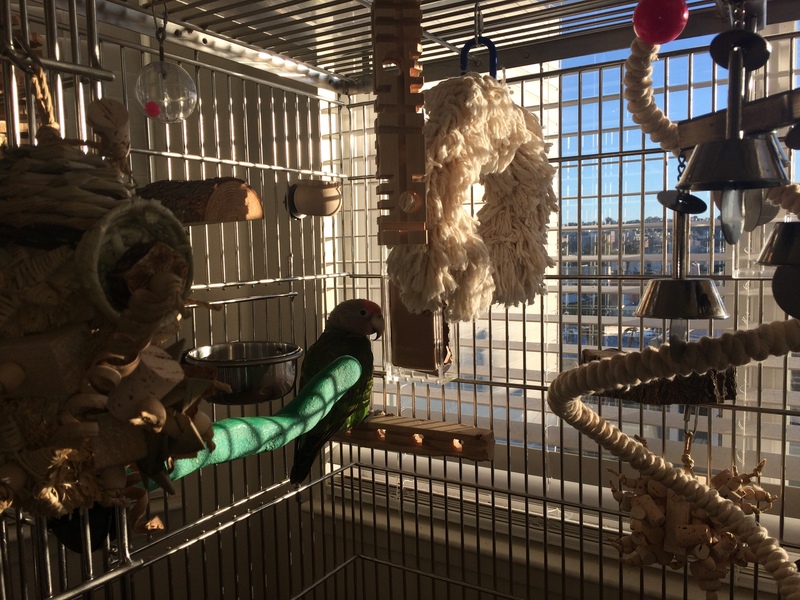 You can see the Eco Perch on the left, but in the foreground is Lola’s snuggly supreme cotton rope swing from Big Beaks. Behind it in the back is her awesome Skywalk perch from Oliver’s Garden. I’m not sure you can tell from the photo, but it’s a really, really cool hardwood platform perch with embedded beads, and a “trap door” of sorts in the center. Hanging above it in the back is a garland toy packed with fantastic parts from I Got a Woody. 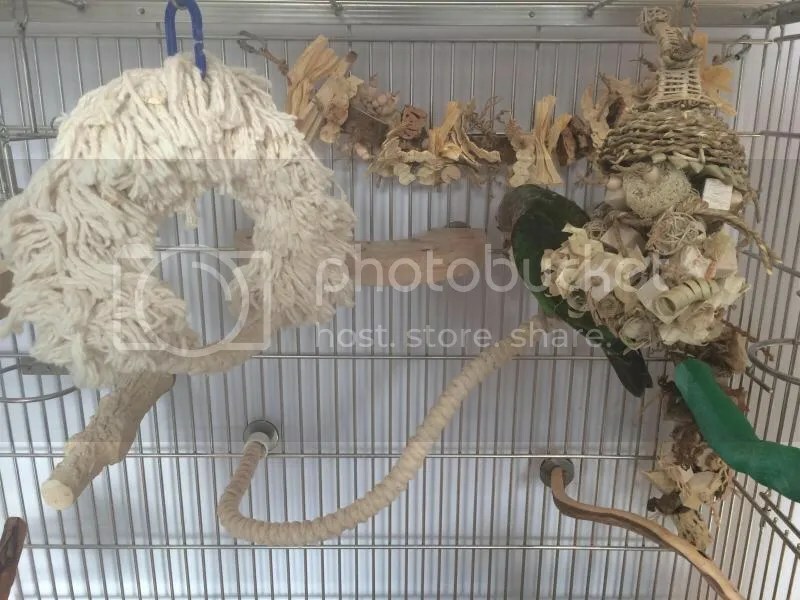 Snaking from the lower center to the upper right is our favorite cotton rope perch from Grey Feather Toys. We are still sad that we can’t get another, but this one is really holding up beautifully. Like I said above, normally there would be an acrylic foraging toy in the center back, but I pulled it out to give it a good wash.
And finally, bringing us to our last view, the right side. There’s the last stainless steel ring holder, and the big toy in the foreground is a really cool Things for Wings toy. It was actually supposed to be a holiday toy, but I requested it un-dyed. It’s big and packed full of toy parts, but most of them are soft shreddables– this would be a great toy even for the little guys who aren’t intimidated by size. It used to have a few more vine balls, but Lola has since torn them off trying to seek out the treats I sneak into them! 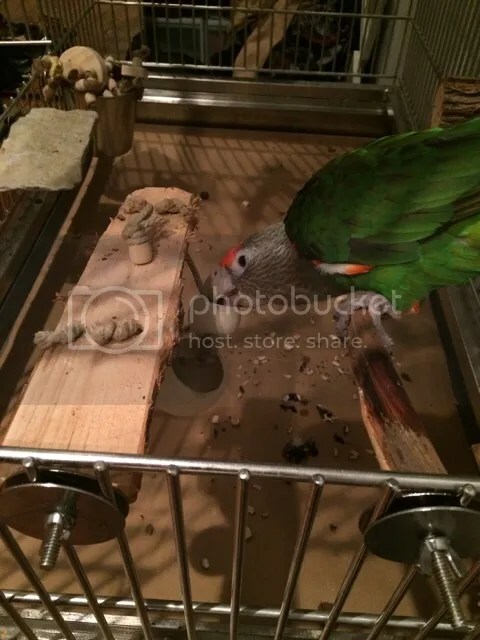 The green perch is a Safety Pumice Perch which also helps to keep her nails trim, and the toy on the far right is another cool side-mounted foraging toy from I Got a Woody. Lola loves to rummage through it for almonds or other goodies. 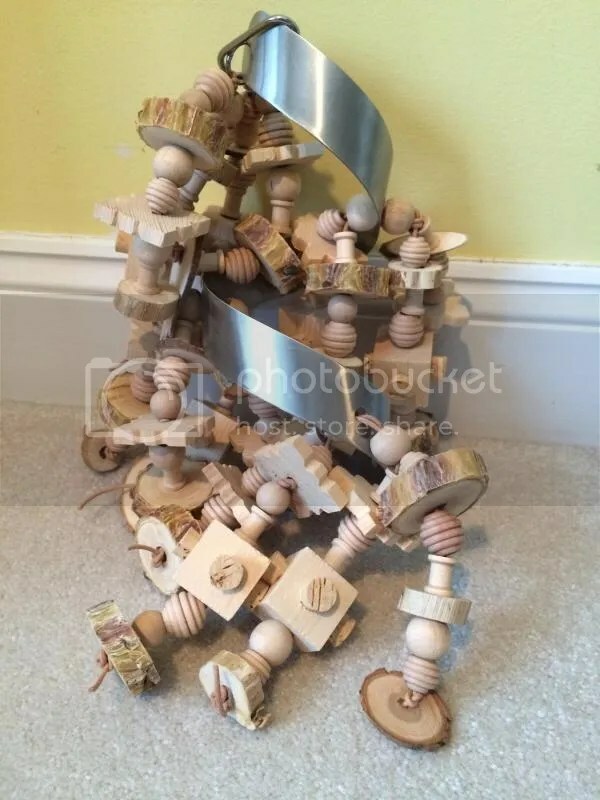 Moving down a level, her faithful stainless steel toy bucket is mounted to the side, full of lots of foot toys and abandoned toy parts, flanked by a natural wood perch. I think it’s sandblasted manzanita, as is the corner perch. Hanging in between it is another great Things for Wings toy. And that’s the current configuration! I’m happy to report that so far, her droppings seem to miss whatever’s below them due to placement. The only one that really gets soiled is the foraging platform, because of its width. So it gets cleaned a lot. Toys get rotated and changed weekly. I like to make sure to change where the foraging opportunities are so that she has to keep guessing. I have this awesome basket toy from Things for Wings (I think it’s called the Cornucopia) which is full of nooks and crannies for treat hiding. That one’s getting rotated in next. The fantastic foraging block might also make an appearance soon. Who knows what else? 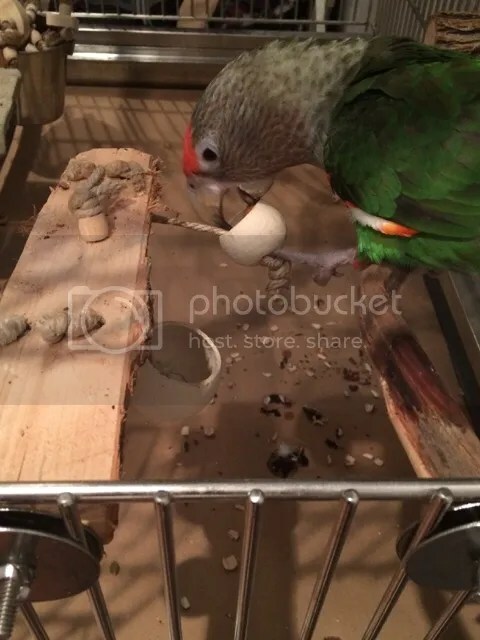 Lola wanted to do a little demonstration on foraging with her very favorite foraging perch from Things for Wings. It’s a little basic, but she thought it might help encourage the beginners. Step one: Scope out the goods. Check out each pod cup and see which one has the best goodies. Step two: Like what you see? Then start foraging! Step three: Sometimes, you need a little bit of leverage. Don’t be afraid to use a firm grip! Step four: Don’t give up! You’ll get it eventually. 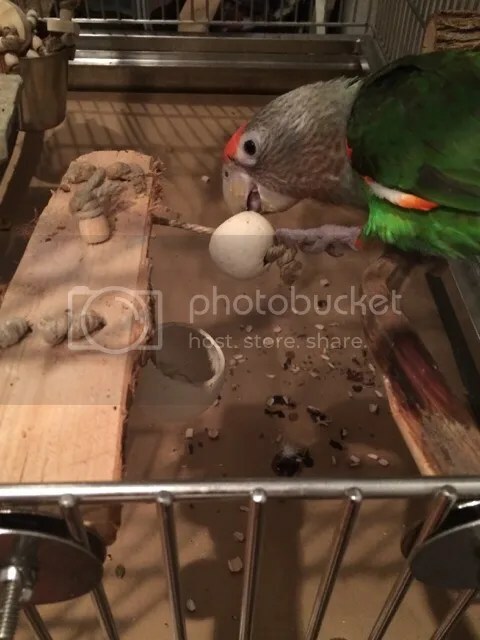 Step five: My darn big beak… just… let me at it!!! Step six: Success!!! Retrieve the nut!!! How Much is the Bird on the Wingdow? In other news, I finally sat down and made a good four homemade toys for Lola! I haven’t done that in months so I was pretty proud. I even refilled the Avian Stainless Do the Twist toy base! Goodness, I don’t envy toymakers at all. My toys aren’t nearly as cute and they sure left my fingers sore! I refilled the Avian Stainless toy base similarly to last time, with lots and lots of wood. 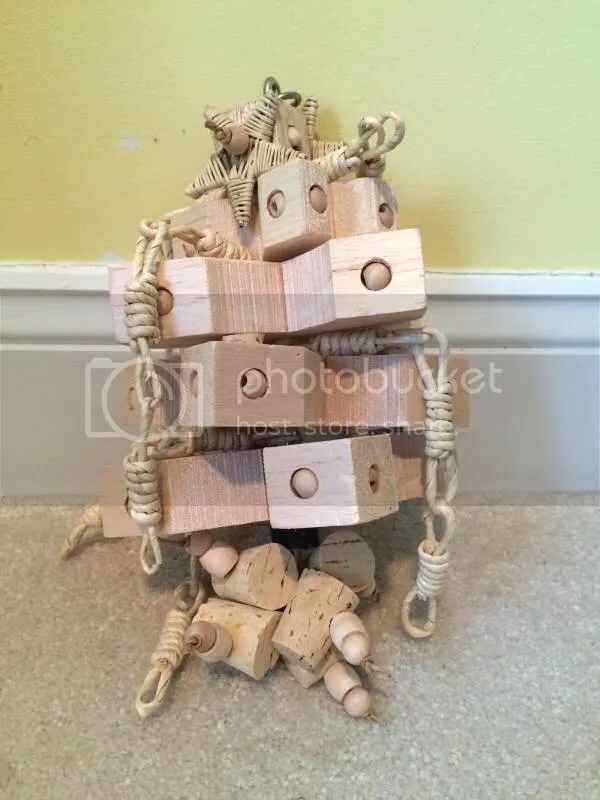 I used hardwood beads, chunky monkey pine squares from Oliver’s Garden, pine chunks with embedded corks from Mother Pluckin’ Bird Toys, and lots of natural wood coins (great stuff like ocotillo, willow, and yucca) from Things for Wings. 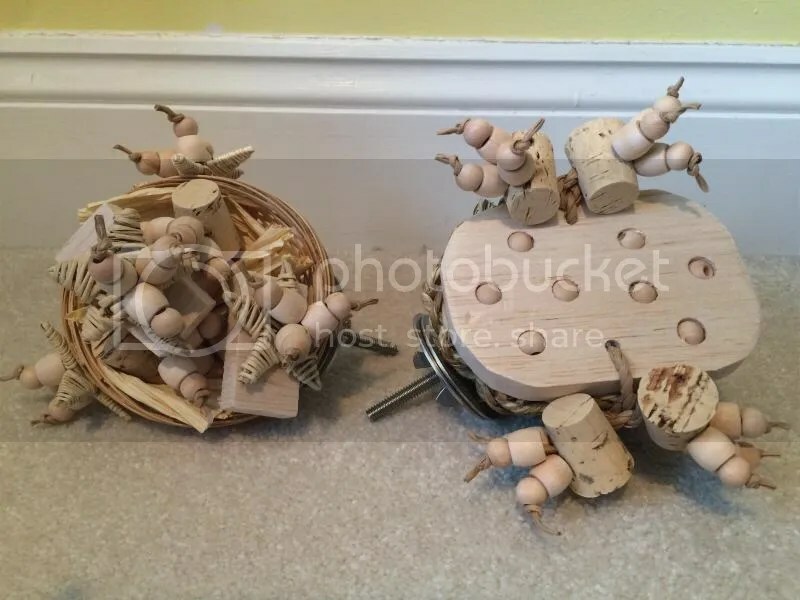 I also made four other toys, the two above and two (really plain looking) rolling pin toy base toys which didn’t merit photos. I used the same types of woods as above. They’re plain but hey, they keep Lola busy! Now that Thanksgiving is over, it’s officially “acceptable” to start decorating for my very favorite holiday of the year: Christmas! 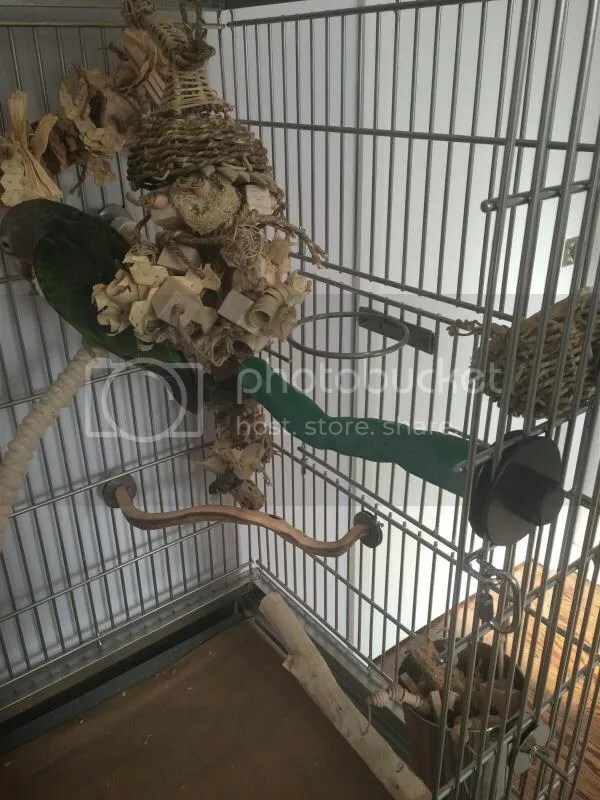 I love getting Lola’s cage decked out with festive decor and ornaments and garlands. Of course, it’s slightly more difficult with my “all natural” color scheme, but thankfully the ladies at I Got a Woody were up to the challenge! I asked them to design a custom toy for Lola– some sort of Christmas tree with a few parameters, but mostly I left the details up to their creative license. I absolutely love how it turned out! There may not be color, but I think it captures the spirit of the season quite well. Unfortunately, my photo really doesn’t do it justice, but it’s lovely. 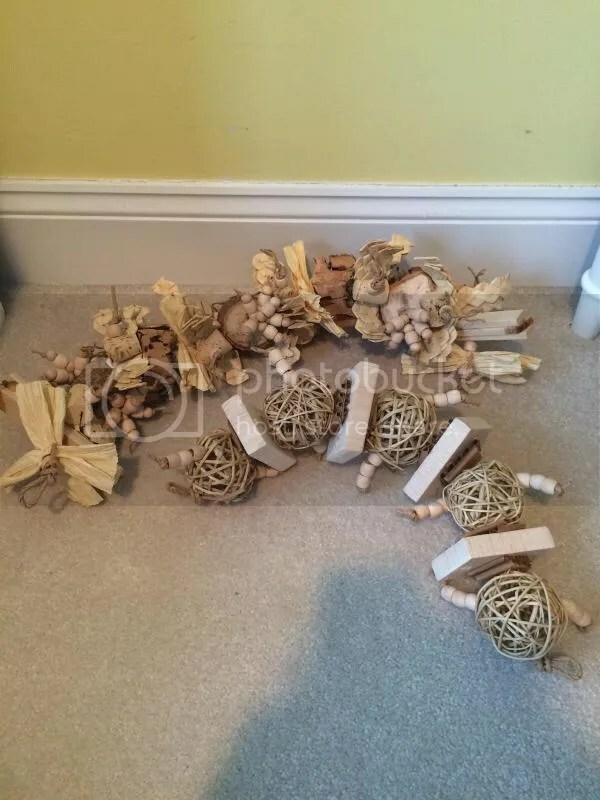 To create the shape of a Christmas tree, they used four carefully carved balsa chunks that mimic the boughs and branches of a real tree, and embedded little ornaments into the branches– cute little hardwood beads. They make great foraging opportunities and always entice Lola. The tree is also decorated with chain garlands hanging from the different levels, and there is a real natural wood trunk at the bottom (not visible in the photo). 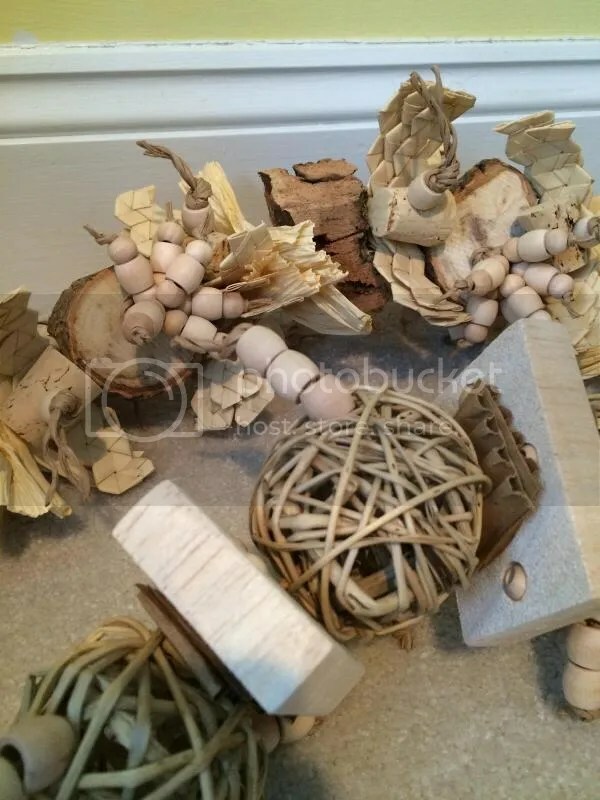 Beneath the tree are extra fun presents, in the form of chunky corks and hardwood beads. It’s even topped off with a pretty wicker star! What’s more, it’s all strung on a stainless steel skewer, so when Lola’s all done destroying it, I can refill the base and turn it into an entirely new toy. This toy came out perfectly. I couldn’t be more pleased. I purchased another Christmas toy, but without the color– it doesn’t quite look like Santa’s Belly without the distinctive red, but I still think the toy is awesome. 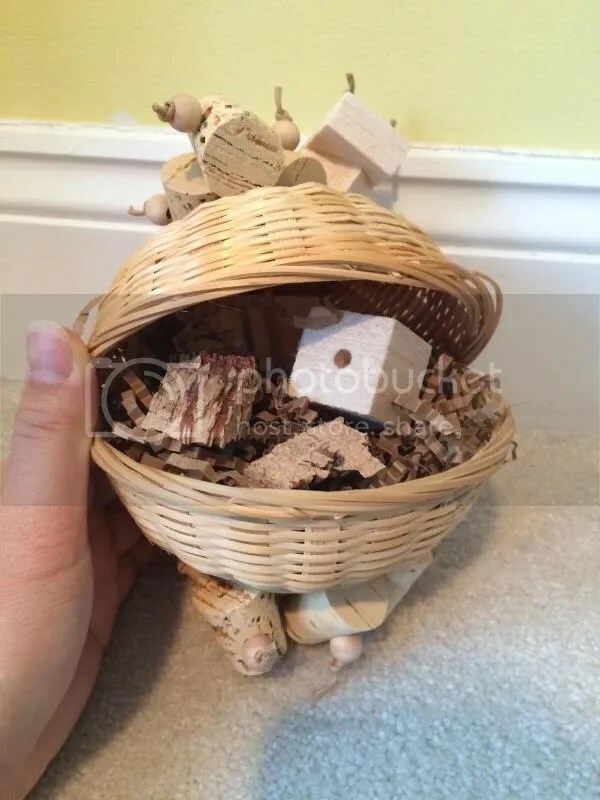 It has two wicker baskets that hide lots of treats within, like basswood, turned corks, natural cork bark, and more. Of course, there’s lots to chew both above and below as well! 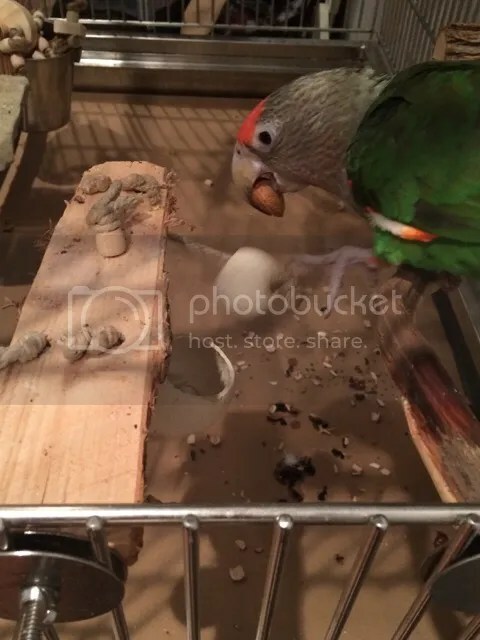 I wonder how long it will take Lola to realize that it’s the perfect spot to hide an in shell almond. A few other toys also incorporated the foraging opportunities of baskets, but in the form of side-mounted toys instead. They both come equipped with stainless steel mounts, which I love because they can be installed exactly where you want them (as opposed to only where there’s a horizontal cross bar). 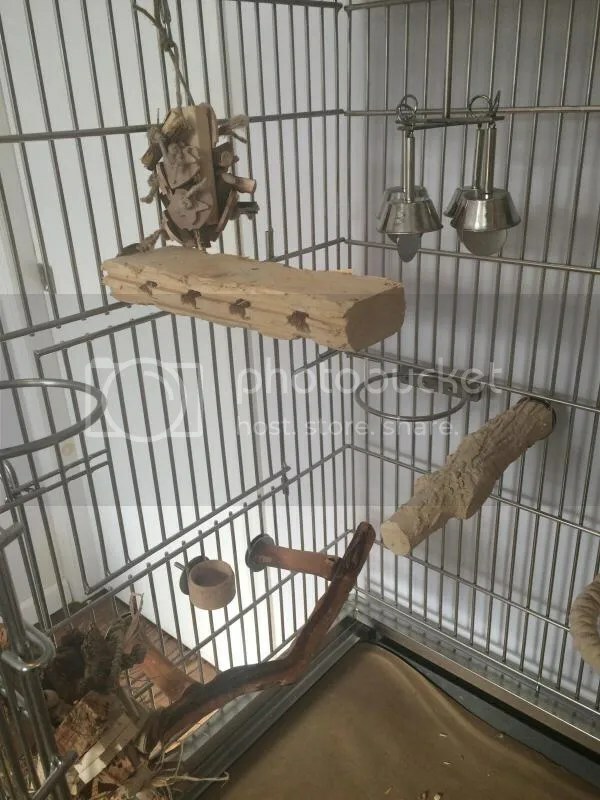 I especially like to install foraging toys at lower levels of the cage, where Lola might not necessarily visit without something to attract her there. The possibility of a treat hiding in one of her baskets always does the trick. 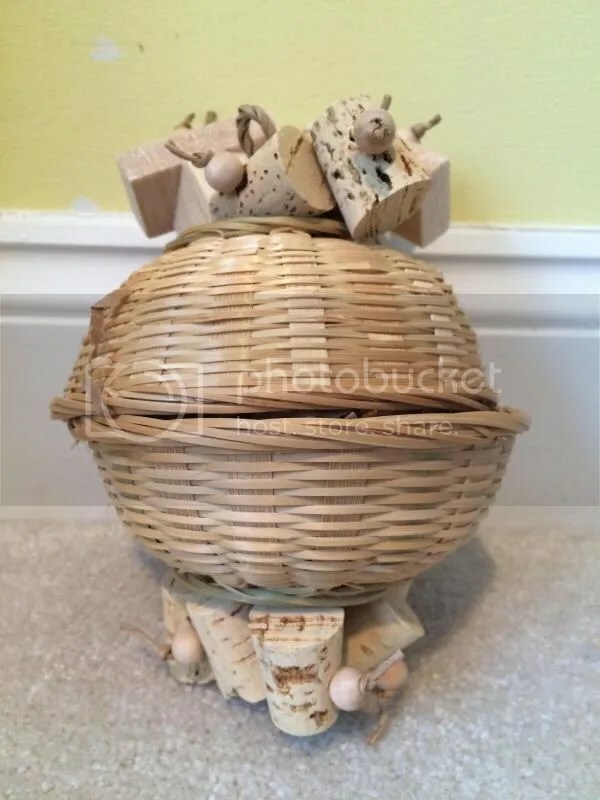 The smaller basket on the left is open on top, but has cork, wicker, and beads flowing from it, whereas the basket on the right has a balsa “cover” that hides the goodies within. These garland toys are huge and packed with so many toy parts. 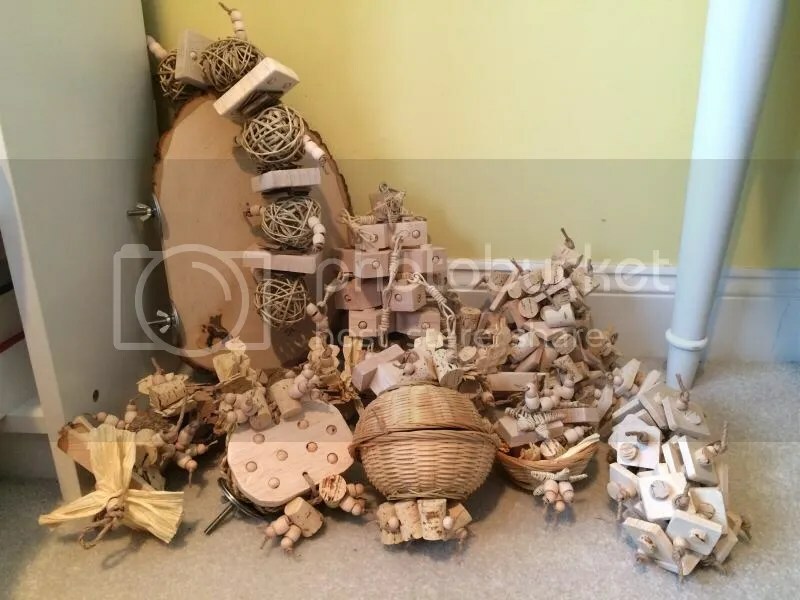 The first one, Twigs and Berries, really has a ton: basswood slats with bark, willow chunks, natural cork bark, tons of hardwood beads, shredders, paper, and probably more. It’s a really good size and will definitely last at least a little longer than Lola’s average toy. The next toy included a few custom twists, like larger vine balls (which are also great for foraging! ), and includes balsa with embedded beads, cardboard, and even more beads. The garland toys can be hung at both their ends, either side to side, up and down, diagonally, or even hanging from the ceiling like a swing. The last two toys are surefire hits. On the left is the Isis. I made the mistake last time of only getting the small version, which Lola quickly turned into toothpicks in no time. She couldn’t get enough of fishing the turned corks out of the thin, crunchy pine. So this time, we got the large. But perhaps I didn’t quite learn the lesson because I only ordered the Mini Sanitarium. (Yes, there’s and even bigger version!) This one has huge jumbo corks and basswood triangles. We’ll see how it fares under her beak! The last addition to the order was one of the basswood platform perches. Oh my goodness, I had no idea how MASSIVE it is! It’s like a serving platter! I think it’s a bit too big for the inside of Lola’s cage, so I’ll have to figure out where it can go. Perhaps it’ll be her new balcony? That ‘s it all together. We are so happy with this awesome order and are ready to get decorating! © Coco's Flock, 2010-2013. Unauthorized use and/or duplication of this material without express and written permission from this blog’s author and owner is strictly prohibited. 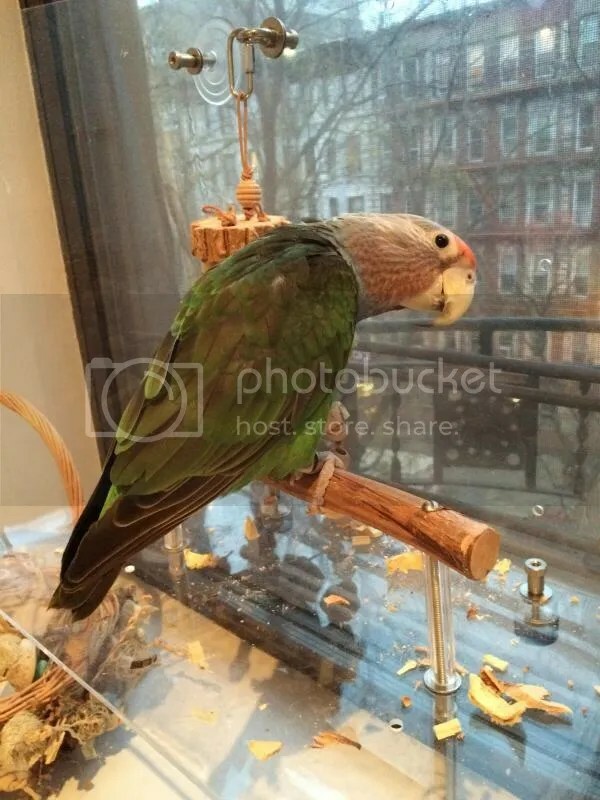 Excerpts and links may be used, provided that full and clear credit is given to Coco's Flock with appropriate and specific direction to the original content. Photos may not be used without prior express authorization of the author. 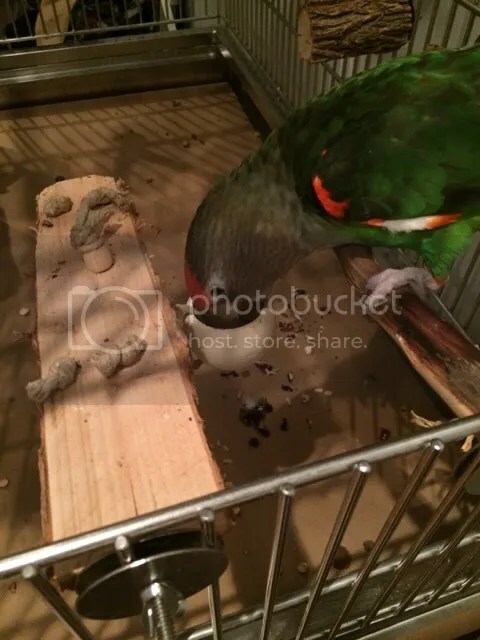 A Parrot For Keeps A wonderfully informative blog with great entries to enlighten even a seasoned parrot owner. A Story on Wings This blog follows the lives and stories of an Indian Ringneck and a Senegal, all the way from Croatia! 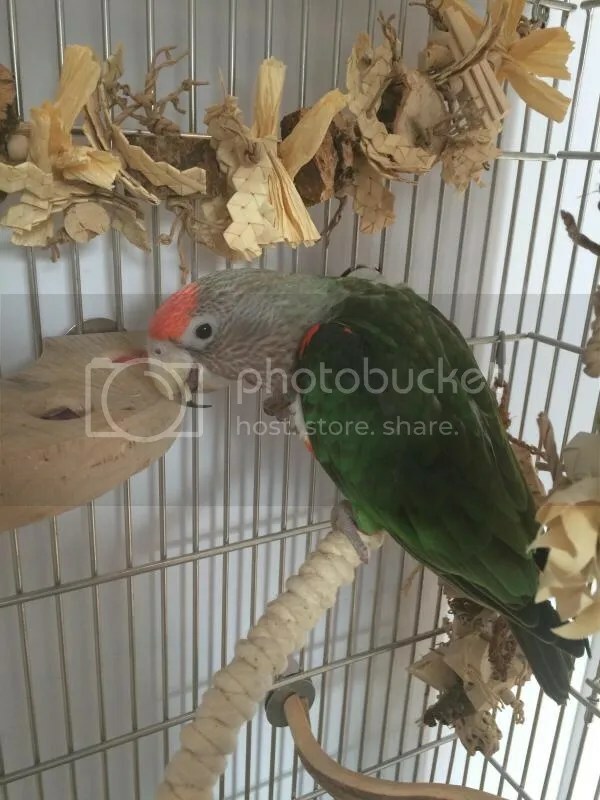 Best in Flock A highly educational blog for parrot owners, and some great advice on training and foraging in particular! Just Poifect! A fantastic blog with beautiful photography that focuses on five Poi’s and one lovebird. Mabel Serendipity A wonderful blog featuring the oft-overlooked Severe Macaw, and a beautiful one at that, named Mabel! Parrot 1-2-3 This blog features very creative DIY projects and other awesome ideas to keep your parrots happy and healthy. Phoenix Landing This is the blog of Phoenix Landing, a wonderful rescue and adoption center that I am proud to support. Avian Avenue AA is one of the friendliest and most informative forums on the web. In my opinion, it is a must for all parrot owners! My username is “lotus15″ — send me a friend request! Thor's Cape Parrot Site This site and forum is a must for all Cape Parrot owners. My Facebook Add me on Facebook! My YouTube Channel If you like the videos you see on my blog, you can check out even more on my YouTube channel!